With net new business gains of $3.201 billion, Publicis Media Group was the winner of the major agency holding companies' media account services reviews in 2018, according to this year's edition of Comvergence's New Business Barometer. The analysis, which breaks down major account wins, losses and retentions, shows GroupM ranked No. 2 with a $2.630 billion net gain, followed by Omnicom Media Group (+$1.959 billion), Dentsu Aegis Network (+$1.055 billion), IPG Mediabrands (+$0.937 billion), and Havas Media (+$0.358 billion). Among individual media agency network brands, GroupM's MediaCom had the greatest net gain (+$2.231 billion), followed by Omnicom's OMD (+$1.717 billion). Looking beyond the big agency holding companies, "all others" including independent media services agencies and smaller shops not associated with the holding companies, would rank second with a net new business aggregate of $3.1 billion. "This includes Horizon Media ($1.1 billion) and Wieden+Kennedy ($210 million) in the U.S.," Comvergence's report notes. 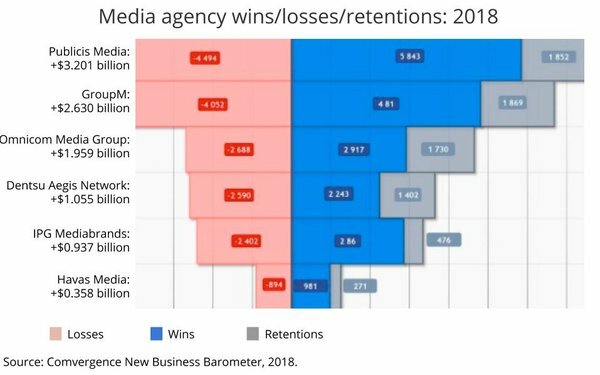 Another interesting finding is that media agencies -- by and large -- are doing a worse job of retaining current business. "The average account retention rate in 2018 was 25% versus 26% in 2017 (and 31% in 2016)," the report notes, adding: "Holding on to clients remains increasingly challenging for incumbent agencies."